With the record heat we have been having I have been making a ton of iced teas. I make them in my french press,even though I have at least 3 perfectly acceptable tea pots. 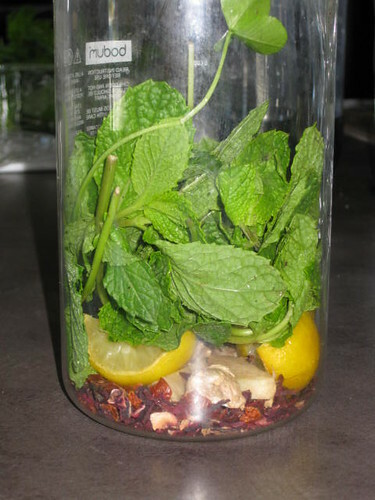 I stick a handful of fresh mint leaves and 1 tablespoon or so of dried hibiscus in the bottom of the french press. Sometimes, like in the picture, I might add slices of ginger, lemon or lime juice, or green or black tea. I heat the french press (glass part only) in the microwave. The only use my microwave gets is to make tea for one person or to avoid turning on the stove. Add honey now if you want a sweet tea. Anyways, I let the mixture steep for 5 minutes or so, then fill almost to the top of the press with ice. I give it a couple minutes to cool, the press it and start drinking- in an ice filled glass of course! I go through a lot of ice!